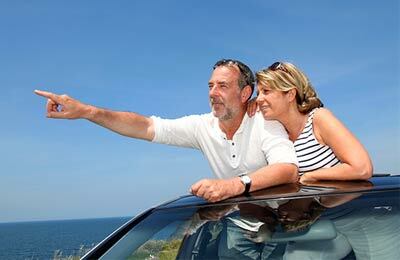 You can use AFerry to book a Trasmapi ferry with AFerry. Trasmapi offer the greatest number of trips between the Pine Islands and are one of the leading companies in inter-island shipping. For the latest Trasmapi prices and sailing times see below. Click on your ferry route for a detailed timetable. 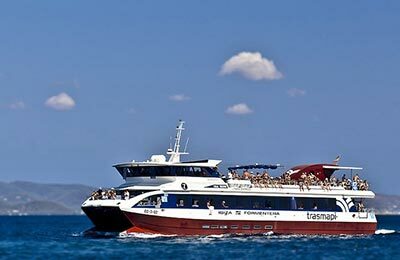 Trasmapi has a fleet of five fast ultra-modern ferries that are all equipped to the highest possible standards. On this passenger only service it will seem as if your holiday has begun the moment that you step on board. 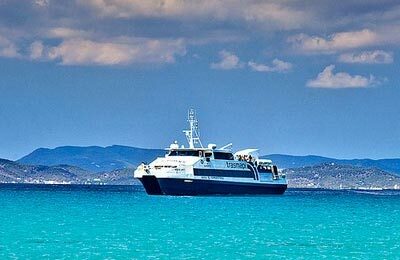 Their ferries, the Ibiza Jet , Eivissa Jet, Formentera Jet, Jet Espalmador and Cala Saona are all catamarans capable of holding between 250 and 350 passengers. Trasmapi's fastest craft the Jet Espalmador is capable of travelling up to 31 knots while the other ferries travel betwen 19 and 28 knots. All Trasmapi ferries offer very comfortable seating, air conditioning and self service drinks and snacks or a bar service. They are also all able to cater for wheelchair users. All their ferries, with the only exception of their fastest vessel, the Jet Espalmador also offer outdoor seating so you can work on your tan even on the boat! Whichever vessel you travel in on your Ibiza Formentera crossing with Trasmapi, you are certain to have a great journey. How long before departure should I arrive for Trasmapi? Ferry was fast and punctual. Comfortable with plenty of seats. You're in for a bumpy ride! Its only a 25 minute journey, but it can get bumpy depending on the weather and other ships that are around. If you're very sensitive to sea-sickness, I suggest you take one of the larger ships that also carry vehicles. It's a simple boat. Not much to say really. A couple of floors. Pleasant enough. Toilet and everything clean. A fast pleasant crossing. Not too many kids onboard - thank God - I've had that problem before - let me tell you! Anyway Muchas Gracias for letting me book in advance. No problems at all!